The United States, its allies, and international organizations are just beginning to come to grips with the civil dimensions of "failed state" wars in Afghanistan, Iraq, Libya, Somalia, Syria, and Yemen. In each case, any meaningful form of "victory" requires far more than defeating the current extremist threat in military terms. The insurgent threat exists largely because of the deep divisions within the state, and the past and current failures of the government to deal with such internal divisions, and the chronic failure to meet the economic, security, and social needs of much of the nation's population. In practical terms, these failures make the host government as much of a threat to each nation’s stability and future as are Islamic extremists. Regardless of the scale of any defeat of such extremists, the other internal tensions and divisions with each country also threaten to make any such “victory” a prelude to new forms of civil war, and/or an enduring failure to cope with security, stability, recovery, and development. They also require a different approach to stability operations and civil-military affairs. Iraq provides a critical test case, and is the focus of a new Burke Chair analysis entitled After ISIS: Creating Strategic Stability in Iraq . This analysis is now available on the CSIS website at https://csis-prod.s3.amazonaws.com/s3fs-public/publication/170711__Iraq_After_ISIS.pdf?2YaQgwPQq4GnjGoSIzhMoQ7eplxQ2vq6. It provides a detailed picture of the challenges Iraq must meet, drawing on material from a wide range of sources—such as World Bank, IMF, CIA, UN, Transparency International, Institute for the Study of War, and IISS—to address the deeper critical challenges that Iraq must address over time if it is to achieve any degree of lasting strategic stability. 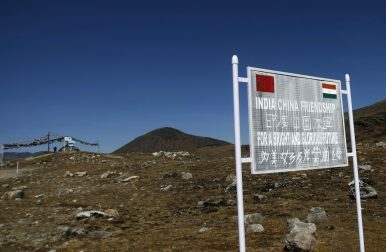 Explaining the political geography at the center of a serious India-China standoff in the Himalayas. While the Kamuthi plant certainly helps India in its race to achieve its installed solar panel goals, there are still a lot of challenges ahead. Despite ample sunlight available throughout the year, India is just about getting started with fully realising its potential. In fact, a look at this report makes it clear that despite India being in the top 10 list when it comes to installed solar photovoltaics capacity, it still lags behind Germany (a nation which gets just a couple of months of sunny weather), when it comes to per capita solar photovoltaics (PV) capacity. At 511 Watts per person, Germany is much higher than its closest competitor, Japan. Germany generated enough renewable energy in 2016, to cover 32 percent of its electricity consumption needs. Is the Indian Economy Poised for a New Phase of Growth? The Indian economy is at a crossroads with major structural reforms underway, such as a unified Goods and Services Tax (GST) that rolled out on July 1 and an Insolvency and Bankruptcy Code that was enacted last year. The GST would dramatically “formalize” the dominant informal sector that drives the bulk of the economy and open it up for credit access. The bankruptcy code will bolster a determined push by India’s central bank, the Reserve Bank of India (RBI), to clean up bank balance sheets of non-performing assets (NPAs) and provision sufficient capital buffers. Those and other structural changes would prepare the economy for sustained growth over the long term, according to Viral Acharya, the recently-appointed deputy governor at the Reserve Bank of India (RBI), who was formerly a professor of economics at New York University’s Stern School of Business. Additionally, India’s equity markets are bracing for a much-awaited uptick in corporate earnings, an increasing flow of new investments from pension funds, provident fund retirement accounts and insurance, and a historical shift in domestic household investments in equities overtaking those by foreign institutional investors. With current stock market earnings multiples at “reasonable” levels, higher corporate earnings and a flush of new money chasing limited equity stock, the stage looks set for Indian stock market indices to triple over the next five years, according to Ridham Desai, managing director and head of India Research at Morgan Stanley. Israeli defense contractor Rafael Advanced Defense Systems successfully completed integration of the I-Derby beyond-visual-range (BVR) air-to-air missile on the Indian Air Force’s Tejas Light Combat Aircraft (LCA) with test firing of the missile scheduled for the end of 2017, Flight Global reports. According to a Rafael representative, the new missile is slated to become the LCAs main air-to-air weapon following the completion of testing by the end of the year. The last test firing of a I-Derby BVR missile occurredat the Chandipur Integrated Test Range (ITR) in the Indian state of Odisha in May. “The objective of the test was to assess the Derby integration with aircraft systems on board Tejas, including the aircraft avionics, fire-control radar, launchers and missile weapon delivery system and to verify its performance,” the Indian Ministry of Defense (MoD) said in a statement at the time. The Taliban senior leadership remains dedicated to realizing an Islamic emirate in Afghanistan. Although that ideology has evolved over time, it would be unwise to expect the Taliban to compete in democratic elections, take cabinet positions, and respect the rights of minorities and free media. Therefore, a negotiated agreement that incorporates more Islamic values within the country’s constitutional democratic framework—which also somehow preserves most of Afghanistan’s social and economic gains since 2001—is unlikely. The Taliban don’t just seek to gain control over the political system, they want change it. Had the group simply wanted a share of power, then its leaders would have come to the table long ago. The movement’s ascendant ideologues reject popular legitimacy and democratic accountability, viewing them as placing the will of the people above that of God. Even the Taliban’s so-called pragmatists—those possibly prepared to entertain a political outcome—seem unwilling to compromise on core principles. A1: North Korea conducted a flight test of an intercontinental ballistic missile (ICBM) that it has designated the Hwasong-14. During the July 3 test, the Hwasong-14 traveled for around 40 minutes before landing in the Sea of Japan, inside Japan’s exclusive economic zone. The missile was launched on a highly lofted trajectory to an altitude of about 2,800 kilometers and traveled some 930 kilometers in distance. Had the same motor’s thrust been put to a range-maximizing flight path, the Hwasong-14 could have traveled as far as 7,000 kilometers, enough to reach Alaska and well in range of Guam. If fired in an eastward direction to take advantage of the rotation of the earth, the Hwasong-14 could potentially reach up to 8,000 kilometers, putting Hawaii at risk. The missile appears to employ at least two stages and operates on liquid fuel. Q2: How significant is this event? A2: This launch represents North Korea’s first-ever test of a true ICBM. An ICBM is classified as a ballistic missile that can deliver a warhead to a range of 5,500 kilometers or more. The definition was set during the Cold War, as 5,500 kilometers is approximately the minimum distance between contiguous Russian and U.S. territories. Whereas the task of Iskander-M OTRKs being deployed in Russia’s Western MD is to hold U.S. and allied forces in the Baltics and Poland at risk, the systems stationed in the Eastern MD appear to primarily serve a different purpose: strengthening both Russia’s conventional and nuclear deterrence against China. Indeed, while an Iskander-M system stationed in Russia’s Kaliningrad Oblast allows Russia to target a wide range of NATO military assets, including the Aegis Ashore ballistic missile defense (BMD) system in Poland, an Iskander-M stationed in Russia’s Far East has very limited ability to threaten U.S. forces deployed in the region. You could be forgiven for thinking that a new dawn in U.S.-China relations was on the horizon. Indeed, Trump and Xi have spoken on the phone on numerous occasions since that weekend meeting, discussing everything from the North Korea nuclear issue and international trade to the South China Sea and the inviolability of the One China policy that has governed Washington’s behavior towards Beijing for about forty years. Unfortunately, Trump has learned the hard way that crafting an improved and productive partnership with China isn’t as easy as picking up the phone and striking up a personal rapport with the Chinese leadership. Notwithstanding all of positive remarks from Trump of Xi being “a great guy,” the Trump administration is quickly coming to the conclusion that the Chinese won’t do America’s bidding unless the White House is able to produce concessions so significant that it would cause a political uproar in Washington. And even then, Beijing may not be willing to deliver. U.S. leaders seem to believe that America can kill its way out of this mess—and that’s totally wrong. On Monday, Iraqi Prime Minister Haider al-Abadi declared “the end of the ISIS statelet” in his country. It's being celebrated as a major, national victory for embattled Iraq, one that has brought dancing revelers into the streets in Baghdad and fireworks over the southern city of Basra. The U.S. government on Tuesday said it could not verify increasingly widespread reports that Russian forces had killed Islamic State group leader Abu Bakr al-Baghdadi, a move that many hope would not only rid the extremist network of its charismatic so-called caliph but also undercut its ability to recruit. "We cannot confirm this report but hope it is true," a spokesman for Operation Inherent Resolve, the U.S. headquarters fighting the Islamic State group, tells U.S. News. "We strongly advise ISIS to implement a strong line of succession. It will be needed." Moscow's claim on Tuesday marks at least the third time its state media has reported that Russian forces killed Baghdadi, stemming from a supposed air strike somewhere outside the Islamic State group's capital of Raqqa, Syria, in May. This time, the U.K.-based non-governmental organization Syrian Observatory for Human Rights confirmed the report. The U.S.-led coalition fighting the Islamic State group, also known as ISIS, has been actively targeting and killing top leaders since the war began three years ago and, within Iraq and Syria, has been quite successful. Army Col. Ryan Dillon told U.S. News last month about these high value targets, saying, "There was an 'org chart,' if you had Baghdadi and his lieutenants and deputies, any HVTs we strike nowadays are typically people who are on the fourth or fifth string." The head of Air Combat Command says one mistake by a pilot in an advanced warplane could mean an unintended escalation in Syria. A fragile ceasefire may have taken hold in Syria but the country’s airspace — crowded with Russian, U.S., Syrian, and coalition warplanes — is as dangerous as ever, the commander of U.S. Air Combat Command says. “Every day, we are a second or two away from miscalculation between airmen are flying on top of each other with advanced weapons, which could lead to an escalation in that conflict,” Gen. James M. “Mike” Holmes said at an Air Force Association event on Tuesday. The fog of war over Syria has been thick since September 2015, when Russian forces arrived to bolster the embattled regime of Syrian President Bashar Al Assad. The U.S. and Russian forces immediately set up a deconfliction line, basically a telephone in the U.S. Air Operations Center that connected to directly the Russians’ similar base. But in April, a confusing situation became a tense one after the U.S. fired a series of Tomahawk cruise missiles at a Syrian airbase. WASHINGTON - The U.S.-led coalition fighting the Islamic State group may increase airstrikes and overhead surveillance support for the fight to retake Raqqa, Syria, now that the militants have been largely defeated in Mosul, Iraq, the top U.S. military commander in Iraq said Tuesday. Lt. Gen. Stephen Townsend told Pentagon reporters he doesn’t see a significant expansion of the U.S. and coalition effort in Raqqa. But he said he thinks there will probably be “a greater level of resourcing,” including intelligence and reconnaissance assets as well as more strikes. “It will become more of a priority now that Mosul is concluded,” said Townsend. The added support would aid the U.S.-backed Syrian forces who have encircled Raqqa, the Islamic State’s self-proclaimed capital, breaching the fortified defenses and moving closer to the heart of the city. Officials are predicting a long, tough battle, estimating that more than 2,000 militants are holed up with their families and tens of thousands of civilians in the city’s center. Would America's B-2 Stealth Bombers Work During a Nuclear War? Air Force engineers explain that UHF connectivity, which is able to send and receive voice and data beyond line of sight, is recoverable in the event of a nuclear detonation but could be substantially degraded. Such a scenario underscores the need to build in strengthened communications links and redundancies to ensure connectivity in extremely high-risk or challenged environments such as those caused by nuclear explosions. The Air Force is upgrading computer and communications technology for its B-2 stealth bomber so the aircraft is prepared to execute attack missions in the event of nuclear war. The service is integrating more resilient receivers, processors and waveforms better able to function in an environment where there has been a nuclear detonation - a circumstance called high-altitude electro-magnetic pulse environment. A B-2 crew, for instance, may need to execute mission orders from the President and receive crucial details of enormous consequence, should a nuclear weapons confrontation take place. For this reason, making sure lines of communication are “hardened,” or sufficiently durable to operate in such an extreme nuclear environment, would be of utmost importance in a highly compromised combat communications scenario. The Pentagon cannot afford the luxury of maintaining excess infrastructure. It’s like owning a vacation home on a beach with a perpetual off season. There is a lot to like in the House and Senate Committee versions of the National Defense Authorization Act (NDAA). Unfortunately, both proposals would force taxpayers to continue to pay for unneeded real estate. Each version specifically prohibits the Pentagon from spending money to initiate a new round of Base Realignment and Closures (BRAC). Defense Secretary Jim Mattis has called BRAC “one of the most successful and significant efficiency programs” at the Pentagon’s disposal. The language that prohibits BRAC funding should be stripped from both bills when they come to the floor. BRAC allows the Defense Department to manage its real estate infrastructure and move functions from one installation to another. And the department sorely needs that authority. America can succeed militarily in the Mideast. ISIS’s defeat in Mosul tells us how. What lessons can we take from the Islamic State’s defeat in Mosul and its coming eviction from Raqqa? The collapse of the caliphate tells us that the United States can succeed militarily in the Middle East if — and probably only if — it works with local forces who are prepared to do the fighting and dying. Where the massive U.S. ground campaigns in Iraq and Afghanistan over the past decade and a half became expensive exercises in frustration, the war against the Islamic State has been far less costly in money and American lives — and also more successful. Amazingly, over the past three years, just five Americans have been killed in action in Syria and Iraq, according to the U.S. military. The overall human toll has been horrific, even if Americans haven’t been paying the price. A triumphal Iraqi Prime Minister Haider al-Abadi proclaimed victory in Mosul on Monday, but pictures of the city showed a devastated wasteland of pulverized buildings. We may never know how many thousands of civilians lie under the rubble. Because the U.S. footprint and casualty levels have been so modest, to Americans this war has mostly been out of sight, out of mind. But it’s worth examining how the strategy has worked militarily — and to recognize the lack of any corresponding political strategy, which may well cause problems down the road. Russian warplanes buzz American forces in the Baltic and Bering Seas, while Russia’s combined forces fight on the front lines alongside the Assad regime in Syria and its special operations forces infiltrate Libya. Simultaneously, China is launching One Belt One Road, expanding “terriclaims” in the South China Sea, and planning military posts in Pakistan and Djibouti. Meanwhile, North Korea, Iran, and violent extremist organizations like the self-proclaimed Islamic State continue to antagonize and threaten American interests. None of these activities are easily confined to one specific country or region. The service chiefs have repeatedly detailed the budget crisis’ effects on readiness and modernization, and military associations have begun adding their voices to the warning as the issue continues to linger. Unfortunately, there is no silver bullet solution that will cure all the modernization issues the military faces -- only time and consistent funding will provide long-term relief. However, in tactical communications and electronic warfare, there are some immediate solutions the military can implement to overcome near-term threats. The future modernization of both tactical communication and electronic warfare command and control systems depends on two critical changes: the adoption of open systems architecture and use of software-defined capabilities. In particular, software-defined capabilities are low-hanging fruit for the military. Implementing open architecture is equally important, but it takes time and coordination. On the other hand, software-defined capabilities allow for quicker upgrades, are more affordable and give more operational flexibility in contested environments. Cyberspace operations, both defensive and offensive, captured the attention of many pundits, military professionals, and interested observers. Their attention has increased focus on the viability of military operations in cyberspace, specifically at the tactical and operational levels. Some argue cyberspace will cause transformational change to warfare, while others argue cyber operations are more likely to evolve into the canon of older, traditional military means. This paper argues from the latter viewpoint, but focuses on the obstacles and opportunities inherent in providing timely cyberspace effects to tactical level commanders. There is currently a lack of literature and thinking on tactical cyberspace employment relative to strategic, and this paper argues for more focus on solving the issues presented by it in order to prepare for potential adversaries who are certainly experimenting with tactical cyber operations now. In September, 2013 issue of Marine Corps Gazette, Maj Paul Stokes presented an argument for a Marine Expeditionary Brigade cyber warfare cell. [i] Maj Stokes added to a growing number of voices calling for tactical employment of cyber capabilities. He envisioned a cyber unit capable of supporting MAGTF commanders with timely and relevant cyber operations. The cyber warfare cell was an excellent idea but the article failed to address the significant practical and policy challenges with employing cyber capabilities at the tactical level. Without squarely addressing these limits at the start of any discussion, tactical cyber will remain a developing capability more risk at from over selling than from under delivering. This article seeks to clarify the issues and practical limits with cyber capability use at the tactical level, while underscoring Maj Stokes call for increased development of viable capabilities that can be tested and trained for. Without experimentation now, the United States risks being at a disadvantage in the future conflicts where adversaries are likely to employ cyber capabilities at every level of war. There will be no slowdown in cyber-attacks. On the contrary, by 2019, IDC research estimates that 70 percent of major multinational corporations will "face significant cybersecurity attacks aimed at disrupting the distribution of commodities." According to giant Cisco, there was a 172 percent jump in DDoS (distributed denial-of-service) attacks in 2016, and we'll be looking at a near tripling of that by 2021. Just in the first quarter of this year there was a reported 380 percent increase in DDoS attacks, according to Nexusguard. U.S. Cyber Command is still a relatively young organization. It was stood up in 2009, and while the organization reached full operational capability in 2010, its workforce isn’t slated to hit this mark until September 2018. During an exclusive walk-through of CYBERCOM’s annual Cyber Flag exercise, the simulation's leaders told C4ISRNET that they identified specific, applicable lessons at last year’s Cyber Flag pertaining to the way defensive teams are deployed to problem sets. Top leaders from CYBERCOM have recently indicated they’ve discovered it's not always necessary to deploy the entirety of a cyber protection team, or CPT.